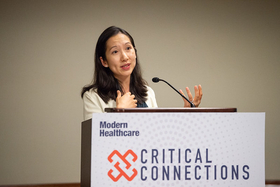 BALTIMORE—The city of Baltimore won a lawsuit against HHS over its federal funding cuts to teen pregnancy prevention programs, city Health Commissioner Dr. Leana Wen learned Wednesday while speaking at Modern Healthcare's symposium on opioids. Wen moderated a panel at Modern Healthcare's opioid symposium on Wednesday that highlighted her "dream team" of professionals who have helped her be at the forefront of addressing the opioid misuse epidemic. They included the leader of the Baltimore City Chamber of Commerce and its local advocacy group addressing homelessness. Wen said their involvement underscored the need for communities to maintain stable and promising futures for children so they don't turn to drugs.